James Marsh’s Project Nim is about the lines between human and ape, and the strange way they blend together. 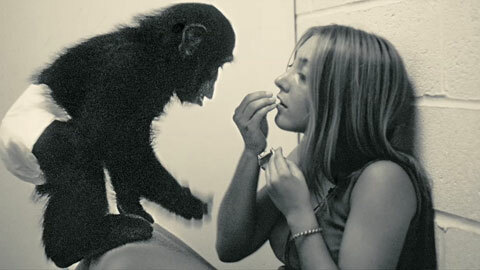 And as much as it is about one very special chimpanzee and his closeness to humanity, it is also about humanity’s own closeness to a devolved state. The film is an interesting and often moving follow-up to Mr. Marsh’s Man on Wire (he also directed the middle section of The Red Riding Trilogy), the awe-inspiring documentary about the man who danced his way across the Twin Towers. Project Nim is a more straight forward documentary; It has a somber tone and a more typical subject. But Mr. Marsh’s focus throughout the film—not really on the experiment, but on the humans surrounding it—is what turns the film into something else. 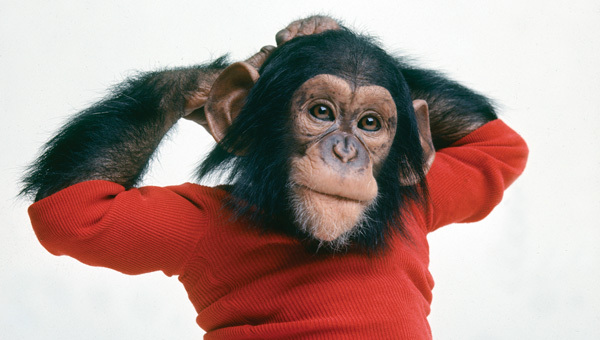 Mr. Marsh sheds less light on the experience of chimpanzees than on the experience of humans. Reading ahead of time is not required though, and Mr. Marsh quickly takes you through the journey of the young Nim, taken from his mother at birth, to his adulthood. His childhood at a laboratory in Oklahoma quickly becomes a brownstone on the Upper West Side with an affluent housewife and a number of daughters. 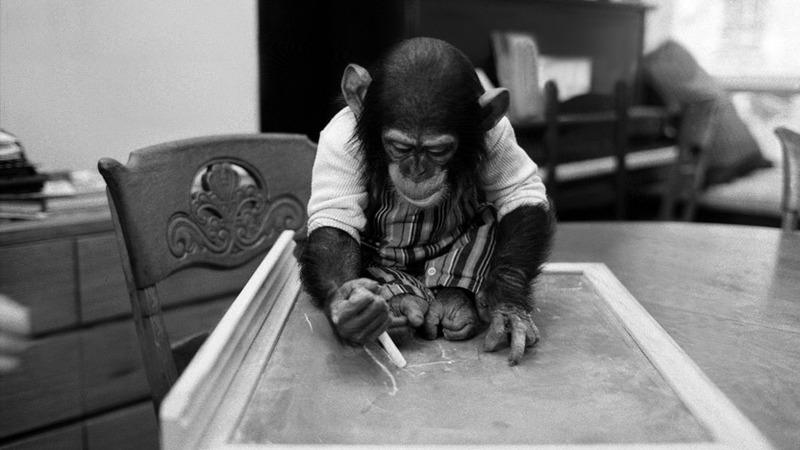 The man behind the experiment, Herbert Terrance, is a linguist as Columbia University with a plan to see if chimps can develop language. And Nim thus traverses not only sign language skills (though limited, in the eyes of Prof. Terrance) but the scope of humanity. He begins living in what feels like a hippie colony before becoming master of an affluent manor north of New York City, and eventually back to the world of other chimps (with a couple of horrifying environements as well). The characters surrounded in Nim’s life are truly a remarkable and diverse group: the hippie mother who saw him as her own child, the teacher who let her emotions get the best of her, the ranch hand who found a best friend, the German scientist who refused to see his emotional state, and many more. Although Nim is our main subject, Nim also can’t speak to us (and died in 2002), so Mr. Marsh makes it much more about the emotions of the humans surrounding him. We see them as they go through their feelings that Nim brings out in them, some of them fantastic, some of them frightening, and a lot of it surprisingly sexual (it’s often humorous how incestuous the project came between the experimenters, thankfully never Nim). Marsh’s style might be in some ways like reporter Jerry Thompson in Citizen Kane, tracking each person as they join and leave the project. What we learn is not really about Nim’s growth, but how Nim transforms them. In many ways, Mr. Mrash is examining how each of us can see what an animal can be: a friend, a companion, a child, a pet, a test subject, or a publicity stunt. Early in the film, one of the people involved asks whether this can be an experiment in the great nature versus nurture debate. That question goes unanswered, as we see Nim both as a person who is truly capable of understanding how to communicate (and manipulate) human emotions, as well as a dangerous animal. Mr. Marsh maybe could have explored that route more, as well as some others. However, it’s obvious from the beginning that his interest has always been humanity, and whether we are the ones truly under the microscope. It turns out the Nim is simply the McGuffin in this bizarre and unique tale.